In 2012, my husband and I sold our home, got rid of almost everything we owned, and went on the road in a 16-foot camper, working full-time as we traveled the country. You might be wondering how to turn such a dream into reality. How do you downsize and get rid of all your stuff? How do you work when you’re traveling all the time? What kind of camper should you choose? Where do you stay? Living full-time on the road is a logistical challenge, and we were overwhelmed by everything we had to learn and do before we hit the road. This article is the first in a series covering what you need to know to turn your dream into a reality, and travel in a camper full-time. Spending our days on an endless road trip had been a dream of ours for a long time. One day, we finally decided to make it happen. It took us roughly six months of preparation, but the day we hit the road made it all worth it. Of course, all the research can’t fully prepare you for what it’s like to live, full-time, in an RV. Whether you choose a deluxe 28-foot Airstream superliner or a 9-foot Scamp, there are some serious adjustments you have to make when you live on the road. I can tell you firsthand, it is amazing. Traveling constantly for 10 months like we did was an incredible experience that I’m sure we will do again. But there are a lot of myths and challenges with this lifestyle that can make the reality a little less sweet if you’re not prepared. On the surface, it sounds like living in a camper would be more affordable than living in a house or apartment. After all, you don’t have to pay rent or a mortgage. You don’t have to worry about homeowners or renters insurance. You don’t have utility bills, property taxes, or the upkeep that goes along with homeownership. And without any storage space, shopping for fun and spending money on frivolous things isn’t an option. The reality is a bit more complex. If you’re not careful, living in a camper full-time can get expensive. For example, if you travel to a new place several times a week, your fuel bills will increase, sometimes dramatically. 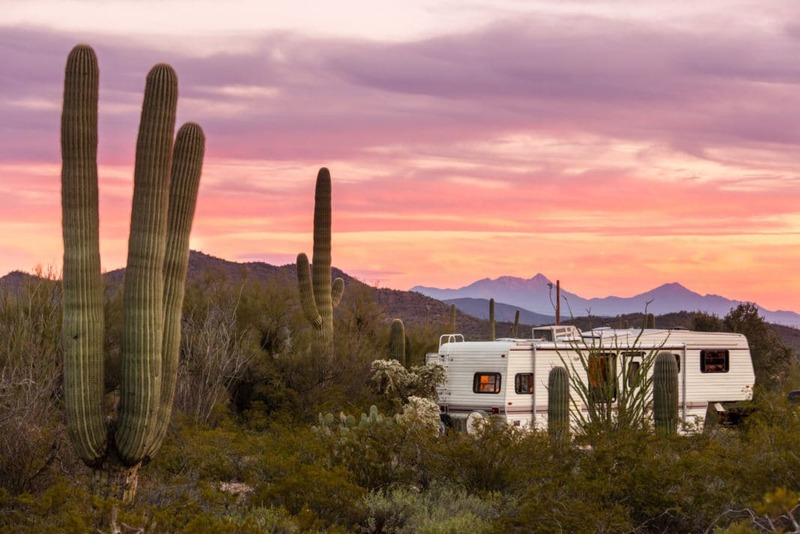 Without careful planning, you might have to spend more nights at an RV campground, whose fees are much higher than state parks. Cooking in an RV can be challenging, so it can be tempting to head out to a restaurant more often than you would at home. Because of limited storage space, you can’t buy food in bulk, which means frequent trips to the grocery store (and more temptation to impulse buy). These are just a few of the financial pitfalls that you can run into living on the road full-time. However, it is possible to save a significant amount of money living in a camper full-time. We did, but it takes planning and diligence. Learning to live in a camper is its own full-time job in the beginning, and it can take months to get into the flow of this lifestyle. You have to learn how to efficiently organize a very small space. You have to learn how to cook (and store food) in an incredibly small kitchen. You have to learn how to manage your fuel and water resources so you don’t run out of either when you’re camped in the middle of nowhere. You also have to learn how to haul a camper, dump your tanks, find affordable places to stay, reorient yourself in a new town every week, navigate sometimes maddening traffic jams – and the list goes on. Add the reality of working full-time on top of all this, and you can see how being a full-time RVer can be an enormous adjustment. If you’re not prepared, you can burn out quickly. My husband and I both work online, so we were able to earn an income while we traveled. We relied on campground Wi-Fi signals and cell data for Internet service. Even with a Wi-Fi booster, getting fast Internet was often a challenge on the road, especially on weekends when many other campers were using the same signal. We would often have to relocate to boost our signal, and there were plenty of times we had to work in a local coffee shop or Walmart. On the surface, it doesn’t sound so bad. But it often got stressful, especially when we had deadlines to meet and no reliable Internet connection in sight. Fortunately, there is greater coverage for cellular data now than there was in 2012, so it’s likely less of a headache if you need to rely on the Internet to earn an income. But cell data isn’t foolproof, especially in some parts of the country (often, the parts that make traveling full-time worthwhile). Another challenge is that in an RV, you probably won’t have a comfortable office setup like you do now. This was the biggest challenge for us on the road. We had no desk and no office chair. We often ended up working in bed, or on a picnic table outside. Yes, we often had amazing views while we worked, but we were also pretty uncomfortable. Stop and think about how much you know about your hometown. You know where to find the best groceries (and which items are cheaper at a certain store compared to another). You know which streets to avoid at rush hour, where to find the cheapest gas, and where to get the best burger in town. When you’re constantly changing your location, you have to put a lot more energy into figuring out where everything is, and how to find what you need. At times, this feels great. After all, you get to see new towns all the time! You’re exposed to new foods, restaurants, and people. It staves off boredom and keeps things fresh and new. Other times, it can feel incredibly tiring. You’ll want something to just be easy for once. And while there are plenty of apps to help you navigate a new place, sometimes you just want to be able to go to a grocery store and know exactly where the oyster sauce is. RV campgrounds can be wonderful. Many campgrounds we stayed in were clean, quiet, well-staffed, and had gorgeous views. Of course, there were also many campgrounds that we’d rather forget. These campgrounds were dirty, crowded, and didn’t live up to the many promises they made online before we got there. No matter how well you plan, there will be nights (probably many of them) when you have to camp in an RV campground or resort. Especially during summer and on weekends, these resorts can make you feel like a sardine in a can. Vacationing families can party late and loud, small children will inevitably wake you up early, and barking dogs left in their camper all day will grate on your nerves. Another element to consider is that as a full-time RVer, you’re a relative minority. When you stay at RV campgrounds and resorts, most of the other people around you are on vacation. This can cause annoyances when you have to get up early the next day to work. With all the challenges that go along with living on the road full-time, why, you might ask, would anyone do such a thing? Wouldn’t it be better to stay at home? For some people, yes. But, there are many reasons why all the challenges listed above are worth it. We spent six weeks in the New Mexico desert. Every morning we woke up to purple-hued skies, dusky mountains, and a silence so complete we felt like the last people on Earth. On our morning walk, the frigid air would be filled with the resinous smell of creosote, while jackrabbits bounded ahead of us on the path. We saw very few people day to day; it was only us and the desert. Living in a camper full-time means that you can park your home somewhere amazing and experience what nature has to offer. You’ll see sights that you wouldn’t get to see if you stayed a weekend, or passed through in your car on the way to somewhere else. I can’t put into words how life changing that can be. Traveling the country will also give you a new appreciation for how amazingly diverse, beautiful, and unique the United States is. We have so many amazing national parks and monuments that, sadly, many people will never get to experience. Living on the road means that you can see whatever you want to see, and stay as long as you like. Most of the time when you travel, you have to stay at someone else’s house, or at a monotonous hotel. In a camper, you’re always home. It makes traveling so much easier when you have a comfortable, familiar home base that comes with you. It also means you don’t have to pack and unpack when you want to visit a new place. You just put the key in the ignition and go. This type of flexibility is priceless. This might sound at odds with the challenge I mentioned earlier. Yes, living in a camper can get expensive. However, you can save a significant amount of money with this lifestyle if you’re savvy. After going through several learning curves, we finally figured out that we were happiest staying in state parks. While some state parks were as expensive as an RV resort, most of the time they were very affordable. You can also boondock to save money. Boondocking, or “dry camping,” means parking your camper somewhere for free for a night or two. This could be at a Walmart or Cracker Barrel (two companies that offer free overnight RV parking), or it could mean parking your RV on a street in the middle of nowhere. 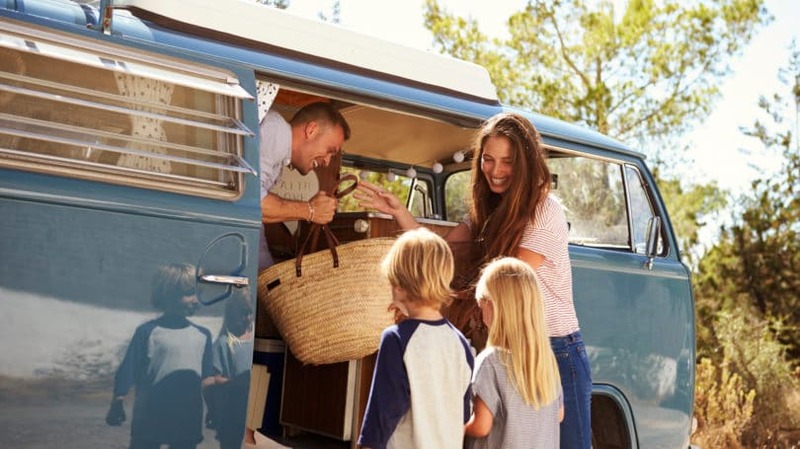 There are many ways to save money living in a camper full-time. This lifestyle can allow you to reach your financial goals easier (and earlier) than you would living in a stationary place. But again, it takes some planning and diligence. One of the best things about living in an RV full-time is the incredible freedom it offers you. If you don’t like where you’re staying, you can move on. If you love where you’re at, you can choose to stay another day, week, or month. If you have family you suddenly want to visit, all you have to do is hit the road. The freedom to travel where the wind takes you (as long as it aligns with your work or income situation) is truly unique to this lifestyle. It can be addictive. You also get the freedom of time. Think about how much time you spend every day picking up clutter and cleaning your house. In a camper, cleaning takes minutes, and there’s little clutter because you simply don’t have the space for it. You don’t have a yard to maintain, which further frees up your time. Yes, you’ll spend some of that time driving and doing other maintenance tasks like dumping your tanks. But after your initial learning curve is over, you will have a lot more free time to pursue other interests. One of the best things about living in an RV full-time is its unpredictability. You never know where you’re going to end up, who you’re going to meet, or what experiences you’re going to have along the way. Some of these experiences will be fun and joyful, while others will make you smack your forehead in frustration. When my husband and I transitioned to a life of full-time travel, we experienced our fair share of bumps in the road. We made tons of mistakes, but we also learned a lot of valuable lessons. Here are the top tips that experienced full-time RVers recommend to newbies. When you first hit the road, you’re going to want to see it all. You might log thousands of miles the first year in a race to see Seattle, the Everglades, and everything in between. The constant go-go-go of new full-timers is a common trap. Of course, it’s a trap that we fell into as well. But, you might ask, isn’t seeing the country the whole point of full-time RVing? Seeing everything our country has to offer is one of the biggest benefits of living and traveling in an RV. However, you don’t have to see the entire country in the first six months. Constant travel – traveling to a new place every day or two – will get expensive quickly. It will also exhaust you to the point where you’re ready to throw away your keys and give it all up. Cherie at Technomadia has what I think is the best piece of advice for new full-time RVers. She says to travel by the “2-2-2 Rule.” This means you don’t drive longer than two hours per day, you stay at each camping spot at least two days, and you arrive at your next destination no later than 2pm. We didn’t come across this brilliantly simple formula until we were a couple of months into our own travels. At this point, we were exhausted, burnt out, and wondering why traveling in an RV wasn’t nearly as fun and exciting as we thought it was going to be. The problem was that we were traveling too much, and trying to work full-time on top of that. So, we decided to try Cherie’s formula and slow down. And, you know what? It made an enormous difference. Traveling became fun again because we gave ourselves the time and space to really experience each place we went. We also had more breathing room in between travel days to work, rest, and do chores. When it comes time for you to start your travels, go slow. There will be plenty of time to see everything, and taking your time will not only make it easier to get acclimated to this new lifestyle, but it will also help ensure that you don’t throw in the towel from stress, frustration, or exhaustion. Instead of racing to your next destination, take some time to experience where you are. Go for a hike, visit the downtown, or go into a coffee shop and talk to the locals. Immerse yourself in every small town and big city you drive to. Your travels will be a richer experience for it, I promise. When my husband and I left for our travels, towing our 16-foot CampLite trailer, we’d never spent a single night in an RV. Ever. The reason why we were so ill-prepared was because of our financial situation leading up to our departure date: We’d paid off our mortgage earlier in the year, which meant we had to sell our home first before we could buy a truck and trailer. So, we closed on our house, bought the truck and trailer, packed up our rig, and left the next day. It was a whirlwind of stress and insanity that, in retrospect, we should have done differently. We should have done whatever it took to buy the truck and trailer first, even if it meant financing them both, so that we could practice getting adjusted to our new life. As it happened, we rolled up to our first campsite after driving all day (another huge mistake), and didn’t know how to do anything – hook up the electric and water, turn on the cookstove burners, run the heat. It was cold, dark, and we didn’t know where anything was. It wasn’t the ideal way to start our full-time RVing adventure. Do whatever you can to practice living in an RV full-time before you actually hit the road. Practicing will help you learn what you need to enjoy this lifestyle and, more importantly, what you don’t. Practicing will help you get comfortable living in a small space and towing it to different campsites. 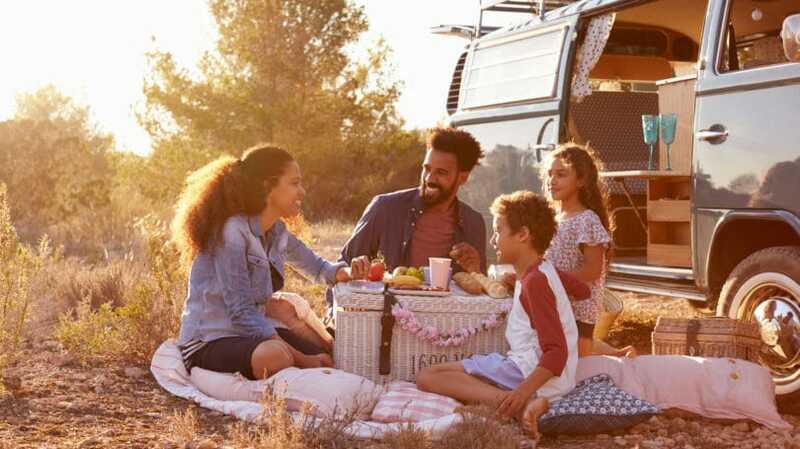 The RV lifestyle will become more familiar, which will make the transition easier when it becomes part of your daily routine. The question of buying a new or used RV is a big one, and there are several things to think about. 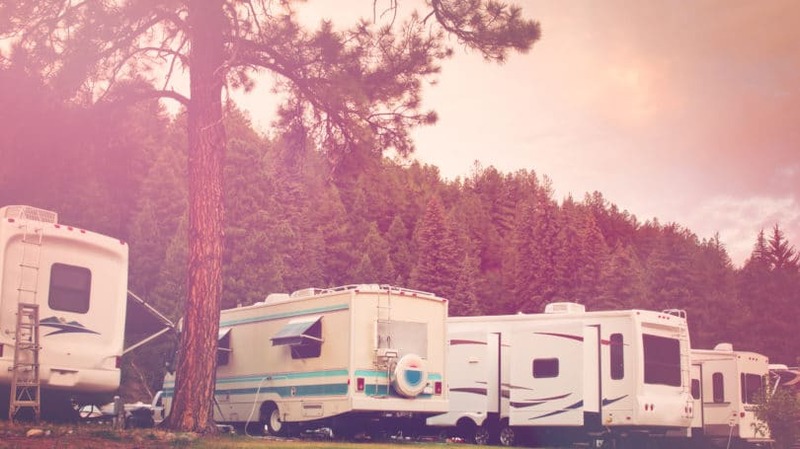 First, it’s important to remember that the term “RV” stands for “recreational vehicle.” Most RVs are not designed or built for full-time living. This means that these vehicles can quickly show their age, especially with heavy use. Buying a used rig might mean buying a few extra headaches, which can include everything from a leaky roof, plumbing problems, sagging mattresses and cushions, or stubbornly slow slideouts. On the other hand, buying used can save you a significant amount of money, and with some good negotiation strategies, you can get a great deal. Many people who decide to travel full-time fall in love with the lifestyle and end up living on the road permanently. Others jump in and realize that this way of life isn’t for them – after they’ve invested a lot of money into a brand-new rig that quickly depreciates. Another aspect to consider is that when you’re new to full-timing, you don’t know what you will want in a rig, especially when you’re living in one day in and day out. If you buy an expensive camper, you’re going to lose a lot of money when you upgrade or change models. Buying a used camper might be the best and most affordable way to try this new lifestyle, and figure out what setup you’d most like to have. If you end up loving full-time travel, you can always upgrade to a new rig in a year or two. Pro Tip: Even if you buy a brand-new rig, things are going to break, so invest in a good tool kit; you’re going to need it. Also, don’t leave home without a full roll of duct tape to make short-term emergency repairs. There are going to be plenty of days when things don’t go as planned. 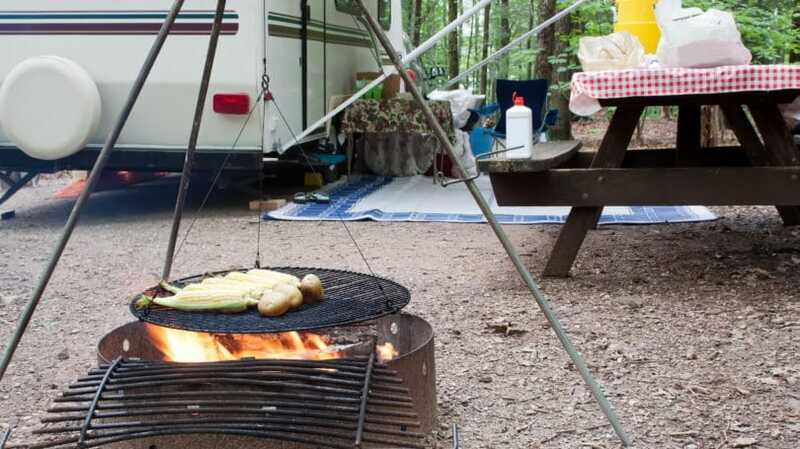 You’ll run over the fire-pit grate and pop a tire while racing to get out of a campsite before checkout. You’ll stumble into a darkened shower stall at a state park, only to realize you’re sharing it with a wolf spider the size of a tarantula and dozens of centipedes the size of your palm. Your GPS will mistakenly steer you into a major downtown area with streets so narrow you have mere inches between your trailer and the other cars. All of these things (and much more) happened to us on the road. We had to learn to be more flexible and, more importantly, to have a sense of humor about the inevitability of mistakes and mishaps. We got there in the end, but if I could go back to my first day, I’d tell myself to lighten up and roll with the punches. You have to learn how to adapt when things don’t go as planned. And, you have to be willing to laugh at the sheer absurdity of this crazy, wonderful life. If you can do that, then you’ll thrive on the road. I’ve mentioned before that living and traveling in an RV full-time can either be very expensive or very affordable. It all depends on your lifestyle, goals, and self-discipline. When we first hit the road, our expenses skyrocketed. We were traveling almost daily, staying in higher-priced RV campgrounds, and eating out at restaurants almost every night because we didn’t feel comfortable cooking in such a tiny kitchen. This didn’t last. We learned our lessons, created a budget, and got more disciplined about sticking to it. After that first steep learning curve, traveling in our RV became affordable, and we were even able to save money while we were on the road. This is why it’s so important to create a budget for your new lifestyle, and do your best to stick to it. You’ll cut down on your expenses by traveling less, working or workamping more, boondocking when you can, and cooking healthy meals at home. You can also save more by using a travel rewards credit card, which can earn you extra money on gas purchases. Getting ready to travel full-time can be overwhelming, but if you take the advice and guidance of those that have done it before, things can be a bit easier to navigate. Take it from me: if you plan correctly, this will be one of the best decisions of your life. 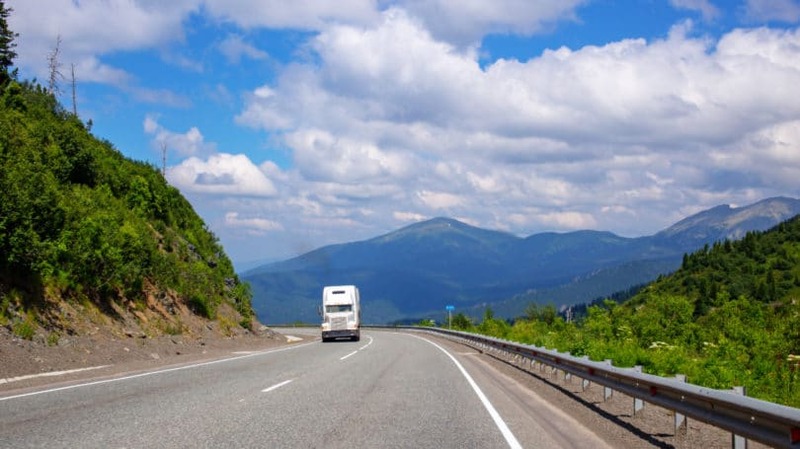 If you’re still on the fence, take a look at our other articles covering RV travel for some inspiration and practical tips. Have you traveled extensively in an RV? What lessons did you learn that you’d like to share with others?